SFWA, the Science Fiction and Fantasy Writers of America, has raised their qualifying pay rate for short fiction to 6 cents/word. Beneath Ceaseless Skies has raised our pay rate to meet this standard; it is important to us that writers be paid a pro rate and qualify to join their professional organization. Yet in this era of difficult financial straits for magazines, with many turning to uncertain revenue sources such as crowd-funding, and with the most successful known revenue stream (Amazon Subscriptions) closed to new vendors, we are mindful that higher pay rates may compound existing financial challenges. We agree with the current increase to 6 cents/word, as this accounts for inflation since the last increase in 2004. However, we would be concerned that any further increase in the near future could leave markets struggling to meet such higher rates, and would lead to them either reducing the amount of original fiction they publish, or not raising their rates and thus losing SFWA-qualifying status, or raising their rates and later ceasing publication when unable to secure additional revenues. All of these outcomes would result in fewer opportunities for writers: for veteran authors to earn their trade; for neo-pros to develop their craft or showcase their work to readers, agents, and novel publishers; for new writers to establish their writing and their membership in the field. Neo-pros and new writers would likely bear the brunt of these effects. Some advocates of additional or larger increases cite the goal of making short fiction rates produce a livable wage. This is a noble cause but a grossly unrealistic one. The Editorial Freelancers Association estimates pro rates for the writing of fiction at 20–25 cents/word. To meet such a standard, SFWA would have to quadruple their new rate, which would strain markets throughout the field (to our knowledge, only one of the thirty SFWA-qualified short fiction markets currently meets that rate). Lesser raises would be inconsequential in achieving a living wage, and would risk the outcomes above in order to make a purely symbolic gesture. We urge SFWA and the short fiction field overall–authors, publishers, veteran writers and new ones–to undertake a thorough dialog on these factors before consideration of raising short fiction rates again. This current era of ebooks, free online magazines, and free fiction podcasts has expanded the short fiction audience across the planet, fostered the emergence of diverse markets, and increased opportunities for established and new writers alike. But meeting the financial challenges of publishing in such a landscape remains a work in progress. Further or larger or unrealistically motivated raises in the SFWA short fiction rate would exacerbate these challenges and could stunt the field’s growth, if not halt or even reverse it. 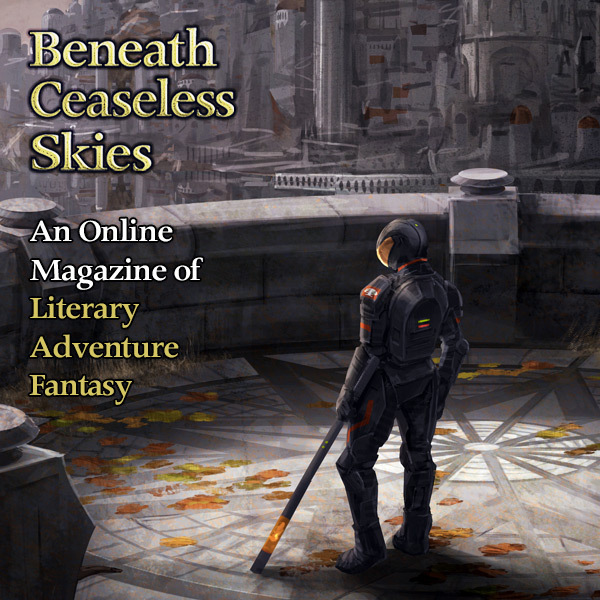 Beneath Ceaseless Skies has always been about character-driven stories set in awe-inspiring worlds. Up till now, those worlds have all been pre-modern. But that’s a personal preference, one that many fantasy readers and our editor share. Couldn’t that awe come equally well from settings that are more advanced than our world, rather than less? Science-fantasy has fallen out of favor in recent decades, but it has as rich a tradition as fantasy, from seminal early works like the 1930s space opera of E.E. “Doc” Smith (writing in the same decades as Robert E. Howard) to best-selling sagas like Frank Herbert’s Dune (breaking out in the same decade as The Lord of the Rings). Their futuristic settings are just as awe-inspiring as fantasy worlds. Arrakis exudes vividness and majesty just as rich as Middle Earth. Character-driven stories set in such worlds can be just as fun as literary adventure fantasy and can comment just as profoundly on what it means to be human. So we at BCS decided to take one month and showcase great literary adventure science-fantasy; stories taking place in secondary-world settings that are futuristic. Three of them are by authors whose fantasy we’ve featured multiple times before. (That suggests that they too feel a commonality between secondary-world fantasy and science-fantasy; read our Author Interviews with them to find out.) These issues will be accompanied by special science-fantasy cover art, the Author Interviews, and giveaways for signed copies of George R.R. Martin’s Jack Vance tribute anthology. We hope you enjoy BCS Science-Fantasy Month! And if you prefer your fantasy worlds not so futuristic, rest assured that literary adventure fantasy will return to BCS next month. The committee’s recommended criteria offer a good distinction. If a magazine provides a quarter of the income of any staff member, or is owned by a company that provides a quarter of the income of any person, it would be a pro zine. That makes perfect sense. Lightspeed and Weird Tales, for example, are both owned by publishing companies with full-time employees, and those magazines clearly have a different footing than Clarkesworld or Space and Time or Beneath Ceaseless Skies. The main flaw with his idea is its fundamental misunderstanding of why some non-pro zines, like Beneath Ceaseless Skies, pay a pro rate for fiction. We are making this announcement now to show support for the campaign to Save the Semipro Zine Hugo Award. There is a resolution up for vote at this year’s WorldCon to abolish that Hugo category. We feel that abolishing this award would eliminate a key way to recognize the many vibrant magazines operating at this vital level of short fiction publishing. For more on why we think passing this resolution would be a grave mistake, see this discussion on the BCS Forums. If you agree, please visit Save the Semipro Zine Hugo and learn how you can show your support.